Galhinia was being sold in an informal settlement last year (2009), when I bought her. 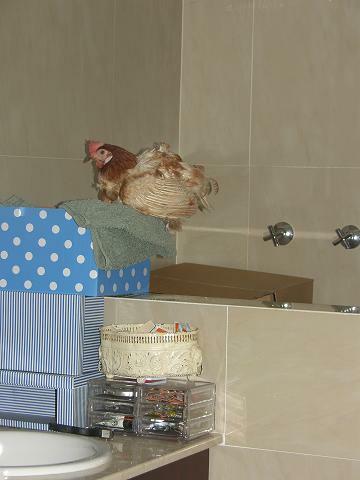 I had to pay some extra money for her, as the additonal benefit of this chicken was that she had been partially plucked alive for re sale. 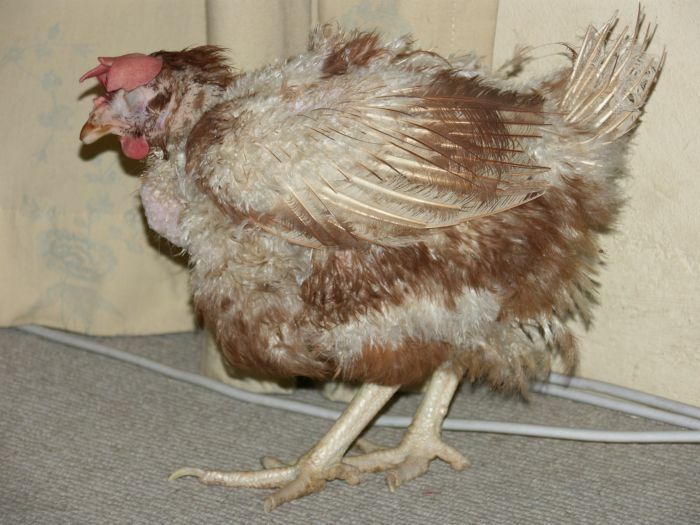 An immensly cruel and painful process for the hen. 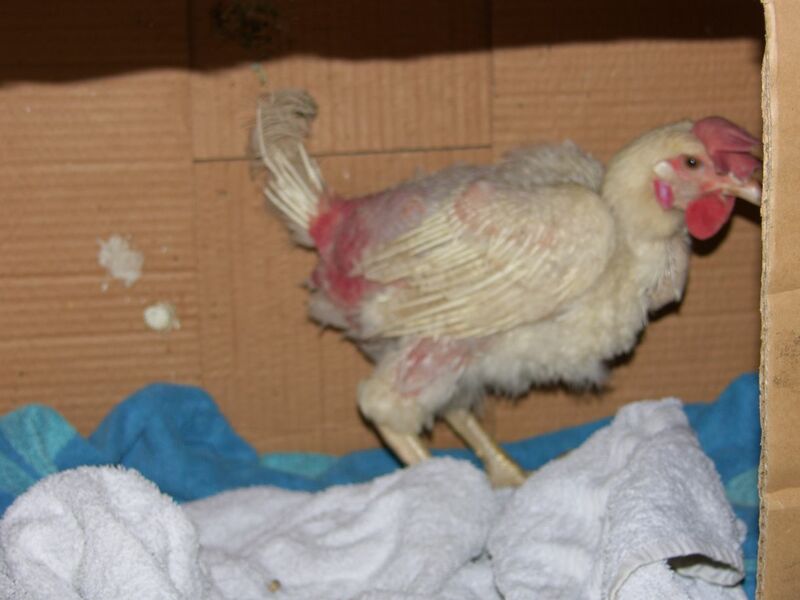 Galhinia had large sores on the sides of her body, probably where she had hurt herself on the wire cage, and other chickens had pecked at the wounds until they became 1 to 3 cm in diameter. Galhinia was in a sorry state. Using humour is one of the means we use in our family to protect ourselves from the pain of what we often deal with and see in our chickens. My husband called Galhinia our ‘sports model’, as she was aerodynamic! Sun burn was an issue for Galhinia. 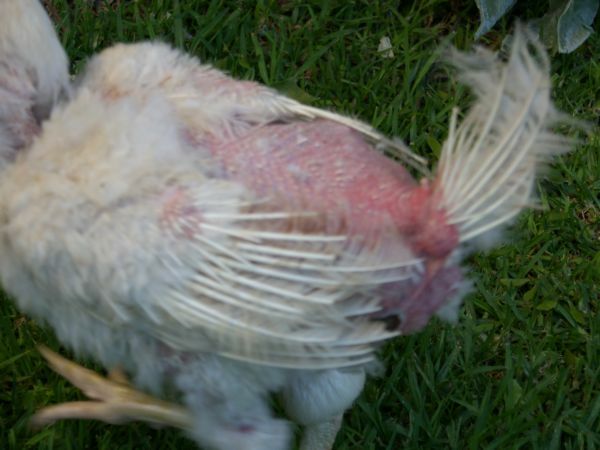 Sun block is NOT an option for chickens, as it is absorbed through their thin skin, and is toxic. We tried as best as we could to keep her out of the burning African mid day sun through the hottest part of summer, but this was not always possible or easy, and her skin became bright red, and sensitive. 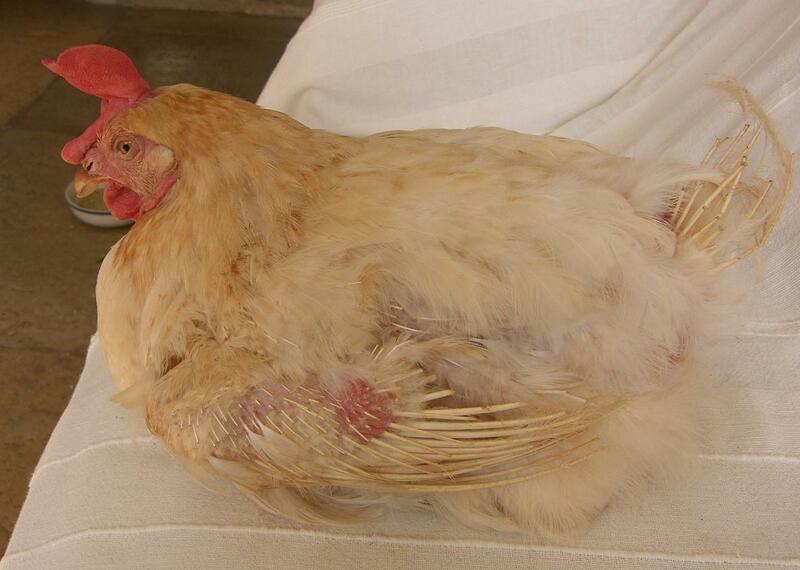 Galhinia has recovered well over the last 5 months, and has stayed at our family home. 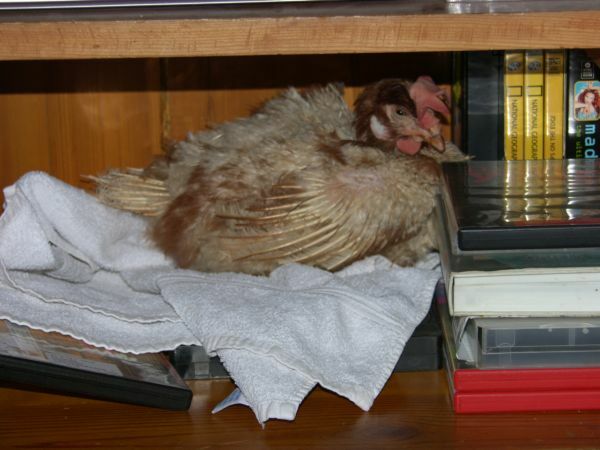 Despite her cruel experience at the hands of her captors, Galhinia loves being with people (as well as other chickens), and spends our meal times under the table chatting to us, and waiting for attention. Galhinia also loves being in the kitchen when we are preparing food. Company aside, she knows that she may get a few little extra bits of food thrown her way. Galhinia LOVES cooked rice, and while we do not give this to her as standard fare, we do give her a little bowl, when we eat rice. She has this amazing repeated cluck which she uses to comminicate appreciation. Rice brings on the famous appreciative cluck. While Galhinia loves being with people, she hates being held or picked up. However, at the end of each afternoon, given the opportunity, she will come and find me in the house and settle on my lap or shoulder for some quality time. I, however, may not in anyway influence this affection. It is all on her terms. So I gratefully sit and wait for my measure of love to be metered out for the day. I look forward to our 10 to 30 minutes together each day. See pic below. Note substantially more feathers than previous pics. 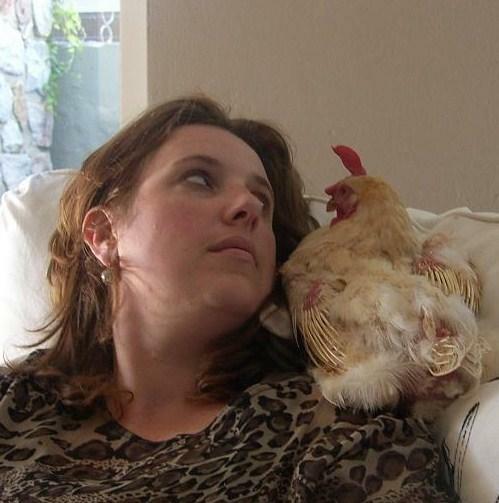 Just after the release of the article in Animal Voice, Fiona Burton from Cape Town contacted me wanting to rescue her own chickens for home. I sent her our standard rescue doc, and last week Marigold and Petunia joined Fiona and her family. I love the way Fiona writes about their new family members, I am very excited that good vibes are spreading and 2 more ex batteries have a home! 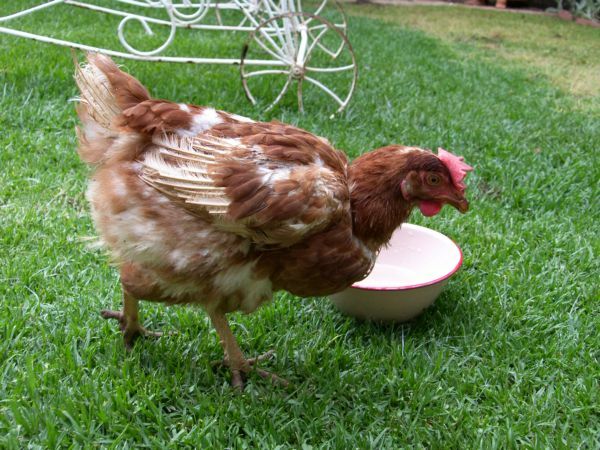 I hope it continues, as people interact with Fiona, and then so on and so on…..
We bought two chickens from Phillipi yesterday morning. They spent the day and last night in our bedroom in a little pen with 2 carbboard boxes to sleep in. We introduced them to the garden this morning and also the chicken coop and they are so happy! As we speak they are both having a morning nap in the sunshine on the grass. Besides missing a few feathers (not too bad at all) and a few long toe nails, they seem in good shape. They ate and drank from the start, so no problem there. I just wanted to check with you whether there are any plants which are poisonous for chickens as they have free run of the garden. Their names are Marigold and Petunia and they are just so lovely, bringing us lots of joy and smiles! We would like to slowly change their food to purely organic healthy feed over time. I have taken photos which I will send you when I figure out how to get them from camera to computer! Chicks are thriving! Today I took them to the vet to have their nails ‘done’. They also were given deworming stuff. They have both started scratching around in the earth and pecking away at whatever they find. Also venturing about the garden more, feeling more confident about leaving the coop. And today Marigold had herself a fine old dustbath, an absolute pleasure for me to watch. They eat out of our hands and dont mind getting stroked like the cat! They sure do poo a lot…. We put a couple of branches in their coop over the straw but they’re still working on the balancing act. Have been introducing more poultry grain and layers pellets into their diet and they seem to be coping well. Hi Candy, chickens thriving. Eating loads and doing everything chickens should be doing, they’re very happy. Still waiting for eggs (which have now become secondary – we just love having the chicks wandering around the garden) They love being around the girls when they’re playing outside. 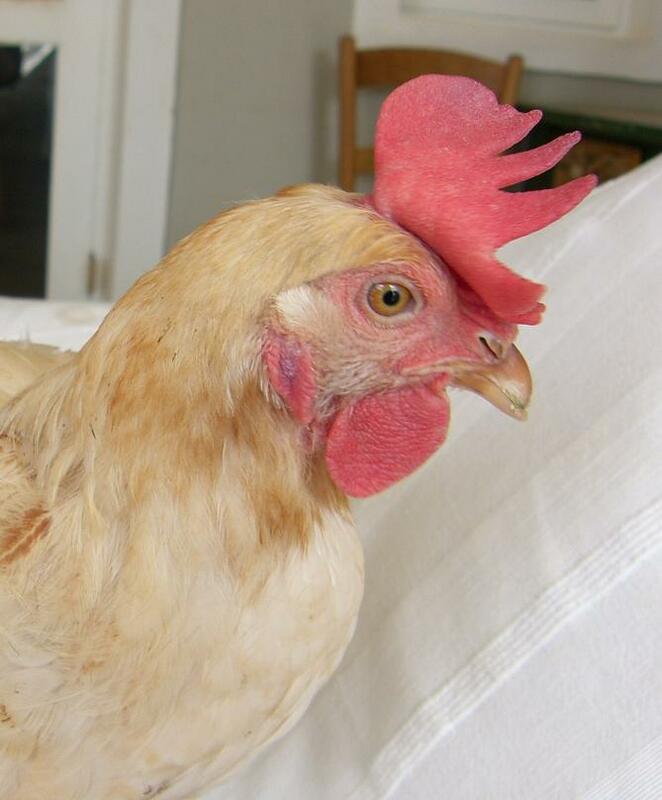 A friend of mine is keen to do the same, and she has spoken to two more friends of hers who also want to rescue chickens, so good news for cape town chickens! Marigold and Petunia put themselves to bed every night, so cute to see.